helpful at times (www.jedit.org) and it\u2019s quite a reasonable beginner\u2019s editor for seminars. Dennis P. Roth, Roque Oliveira, Douglas Dunn, Dejan Ristic, Neil Galarneau, David B.
section, and Sean Neville wrote the first draft of the Flex section for me. 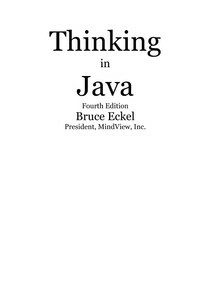 you\u2019ll learn in this book, was a major inspiration for Java SE5). My friend Richard Hale Shaw\u2019s insights and support have been very helpful (and Kim\u2019s, too). perfect learning experience for the attendees. edition was sent from Cape Town, South Africa, and the 2nd edition was posted from Prague. headlines are in Verdana. The cover typeface is ITC Rennie Mackintosh. A special thanks to all my teachers and all my students (who are my teachers as well). kind of warm, furry support. Lynn and Todd, and their families. And of course, Mom and Dad. unconsciously built up on the language habits of the group. problems grow larger and more complex. where the Java mindset becomes your native tongue. to your model and deduce the answer.